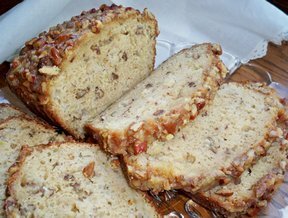 A heavy moist quick bread made with apples and pecans. For an extra special finish to this bread, a brown sugar and butter glaze is poured over this bread after it comes out of the oven. The glaze adds a sweet touch to this already scrumptious bread. This is a perfect recipe for using all those delicious fall apples. Looking for a new way to enjoy all the scrumptious apples this fall? Follow these steps for creating hot and delicious baked apples. Make your next pumpkin dessert even more delicious by making your own pumpkin puree to use in the recipe.